The ForkenSwift was built by combining the best parts from this red 1993 Suzuki Swift (which turned out to be too rusty to use) and the blue 1992 Geo Metro. 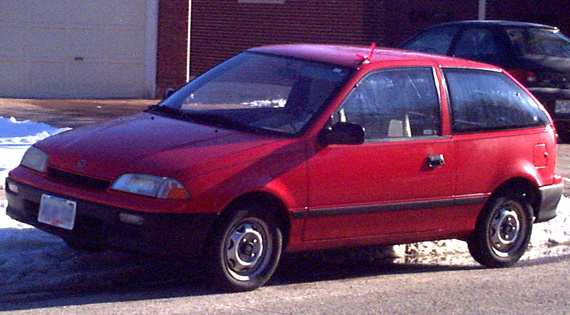 For more information on why we chose this car as a platform, see the 1992 Geo Metro gallery & info page. Fresh from driving it back from the seller's place, the 1993 Suzuki Swift 1.3L, 4 cylinder, 5-speed transmission. Runs well, shifts well, drives fairly squirrely, owing to a rusted/badly repaired control arm mount.